How to Play Coyote Moon Slot game? Coyote Moon is an online slot machine which comes from the IGT stable. This online casino title comes with an animal theme which is skewed in favour of the coyote (as one can deduce from the title). IGT slots fans will quickly notice similarities between this pokie and two other titles from the same developer namely Wild Wolf and Wolf Run. Graphics wise, this pokie of the very best games to be developed by IGT as it comes with some exquisite graphics which will keep the player glued to the screen of his device. To start one’s adventure in slot machine Coyote Moon, players simply need to set in motion the slot’s five reels. This online casino machine comes with 40 paylines. The first thing when looking to play Coyote Moon slot machine is to look around for online casinos that offer this particular title. This is not really a difficult task considering that IGT is a world-renowned software provider which works with a whole host of online casinos hence it’s not difficult to come across IGT slots. As a mobile compatible pokie title, players ought to know that they can use their mobile devices (in addition to the desktop) to search for this online entertainment and play Coyote Moon slot game. Once players locate the game, they will be able to start their gaming adventure. Players ought to know that Coyote Moon is an instant play pokie meaning that there is no download required in order to start to play Coyote Moon slot game. Before players can start their gaming adventure play Coyote Moon slot game, there is one important decision that they have to make, i.e. to choose the game mode they want to play in. More information about the game modes that Coyote Moon slot machine comes in is found below. There are two sets of symbols in this slot machine Coyote Moon, i.e. the standard symbols and the special symbols. The standard symbols in Coyote Moon online slot include a lizard, a hummingbird, a deer, and an animal skull. Just like most other IGT gambling games, players in this title can also expect to encounter some playing card icons. 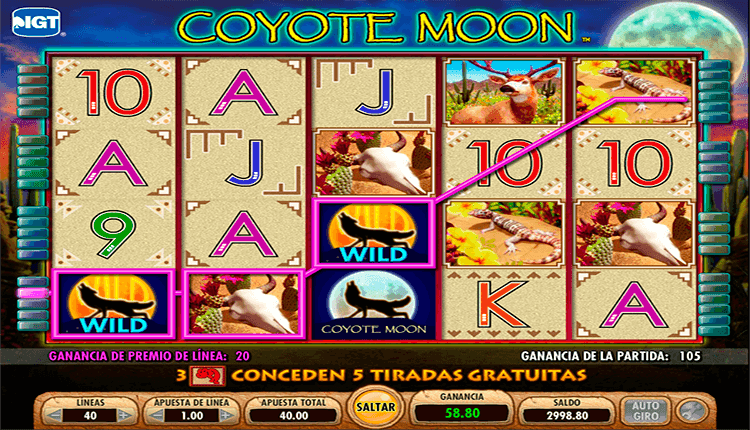 The special symbols in Coyote Moon online slot are represented by the wild and the scatter symbol. The game logo icon in Coyote Moon free online slot acts as the wild symbol meaning that it does have the capabilities to substitute for other icons bar the scatter. The red icon acts as the scatter symbols, and it has a crucial role in activating the game’s main bonus feature. Coyote Moon online slot game does come with just a single bonus feature which is the Free Spins Feature. To activate this feature in Coyote Moon free online slot, the player has to land 3 scatters on reels 2, 3 and 4. In return, the player gets five free spins. During this feature, all winning combinations receive a 2x multiplier. All symbols in this feature remain the same, but they will take a purple hue. Free spins can be retriggered. At random when gamblers play Coyote Moon slots online for free, any of the five reels will be transformed in stacked wild reels. When this happens on more than a single reel, the player will get some highly lucrative wild wins. The symbol which carries the highest payout in Coyote Moon slot game is the game logo icon which also acts as the wild symbol. If the gamer catches three of these, he is awarded 50 coins. The symbols which carry the second most payouts in Coyote Moon slots are the deer and the hummingbird. For three of the same kind, the gambler gets 25 coins. The symbols which carry the third most payouts in Coyote Moon slots are the cow skull and lizard. When the player matches three of the same kind, he is awarded 20 coins. The lowest paying icons in Coyote Moon slots are playing card icons. A and K among these fetch the highest payouts fetching 150 coins for five of a kind, 50 coins for four of a kind and 5 coins for three of a kind. Queen, Jack and numbers 9 and 10 fetch the lowest payouts fetching 100 coins for five of a kind, 20 coins for four of a kind and 5 coins for three of a kind. Earlier, we alluded to the fact that Coyote Moon can be played in different game modes. In all, there are two game modes that this casino game can be played in with one of those being the demo mode. The demo mode allows players to play free online Coyote Moon slot machine. In order to do this, players playing in this mode receive free credits from IGT which they use in wagering. This, therefore, means that the player is not required to deposit any money in the demo mode. When looking to play Coyote Moon slots online for free at select online casinos, players also ought to know that they can access and play the free Coyote Moon slot machine online even without registering an account! Apart from the demo mode, gamers can enjoy online Coyote Moon slot machine in the real cash mode. The name of this mode does say it all as in, what to expect, i.e. wagering with real cash. The beauty of doing this rather than playing for fun in the demo mode is that here, players are able to withdraw their winnings whenever they land winning combinations. To start playing in the online Coyote Moon slot machine real money mode, players will have to wager with at least 0.40 coins per spin. The highest bet amount is set at 1000 coins per spin. Coyote Moon slot game is a low to medium variance pokie game whose RTP stands at 93.75 per cent. Coyote Moon game can be accessed both on the desktop and on mobile.